Two big events in the history of the Feather River were the discovery of gold at Bidwell Bar in 1848 and the construction of the Feather River Railroad through the Sierras from 1906 to 1909. The railroad opened up the river for a series of dams starting with the Big Bend Dam in 1908 and culminating in the Oroville Dam in 1968. The building of the Oroville Dam required the Western Pacific Railroad to build a new alignment (and new bridges) from Oroville to Big Bend. The new bridges included the Thermalito Diversion Pool Crossing, the lower deck of the West Branch Bridge that we studied last month, and today's North Branch Bridge. Railroad bridges can often be purely utilitarian structures but the North Branch Bridge is a happy exception. It's a reinforced concrete bridge composed of three parabolic arch spans supporting wide spandrel pier walls and a concrete deck. At 990 ft long it is one of the longest reinforced concrete railroad bridges in the United States. I wonder what possessed the Western Pacific Railroad to build such a beautiful bridge in the middle of the wilderness? It seems like we feel more affinity for bridges that were built for a certain mode of travel. The Happy Pontist likes pedestrian bridges because they afford designers more freedom of expression and (perhaps) because people traveling on foot or bicycle seem more positive and friendly. We have less interest in highway bridges because of their cookie cutter appearance and because they carry vehicles with fewer positive connotations. The most passionate group are people who love railroad bridges and the trains they carry. 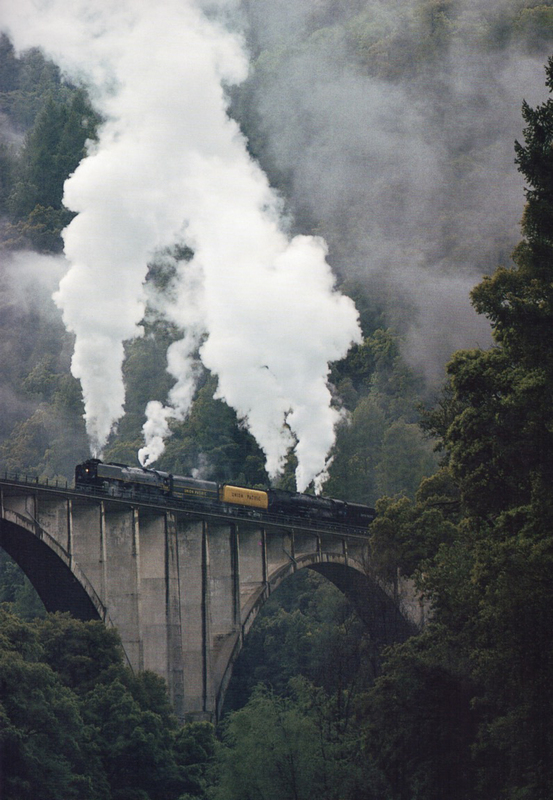 People often line railroad tracks to photograph trains crossing over bridges, especially if they are being pulled by an iconic locomotive (photo by Keith Ardinger shown above). 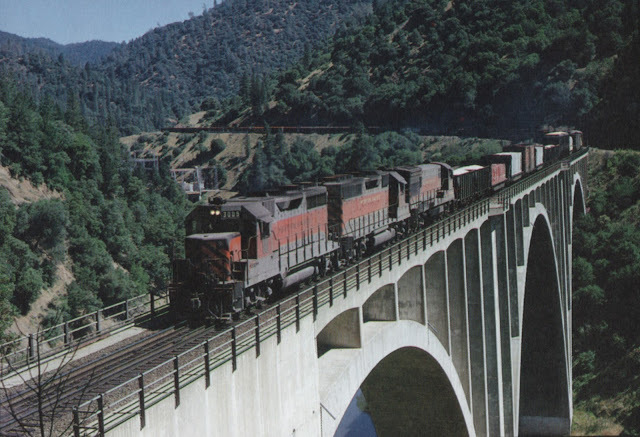 However, only freight trains currently travel along the Feather River Canyon. On rare ocassions 'fan' trains with vintage cars and steam locomotives will cross over the North Fork Bridge (photo shown below by Dave Stanley). Butte County, California Bridges: Union Pacific North Fork Bridge by Mark Yashinsky is licensed under a Creative Commons Attribution-NonCommercial-NoDerivatives 4.0 International License.